After taking some time off for the all-star festivities, the NHL's regular season is back just in time for the weekend. And there will be plenty of action, thanks to a half dozen Friday night games and 11 more on Saturday. There are even three Sunday matinees on the schedule. And then, nothing. The league has taken Sunday night off. After some in-depth investigative journalism, I think I've uncovered the reason: apparently there's a football game that night. Presumably, the NHL has decided that it would be rude to overshadow another league's title game, and is allowing the Super Bowl to have the stage to itself. That's a nice gesture, but it will be jarring for sports fans who binge on hockey all weekend and then have to switch gears. In an attempt to ease the transition, here's a list of some key differences between regular season hockey and the Super Bowl to watch out for. The Super Bowl: If you see fans wearing cheese on their heads, you'll know that they are fans of the Green Bay Packers. Regular season hockey: If you see fans with food on their head, you'll know that whoever is throwing waffles at the Maple Leafs that night has a weak arm and poor depth perception. The Super Bowl: Any coach who wishes to issue a challenge will immediately drop a red flag onto the playing surface. Regular season hockey: Any goaltender who wishes to issue a challenge will immediately drop Rick DiPietro onto the playing surface. The Super Bowl: Many players express their unique personalities by growing their hair long, sporting intricate tattoos, and performing choreographed celebrations after big plays. Regular season hockey: Many players express their unique personalities by choosing a nickname that consists of their last name with the suffix "er", instead of their last name with the suffix "ie". The Super Bowl: You can buy commercial time, assuming you have a few million dollars sitting around that you'd like to waste on something that will have no discernible impact on your product's success. Regular season hockey: Unfortunately, Ilya Kovalchuk doesn't hit free agency again until 2025. Regular season hockey: That thing that takes twenty minutes to complete, plus commercials and breaks for the participants to rest, is called a "period". The Super Bowl: That thing that takes twenty minutes to complete, plus breaks for the participants to rest, is called "Christina Aguilera singing the national anthem". The Super Bowl: A pre-game coin flip is held to determine which team gets the ball first. Regular season hockey: A pre-game coin flip is held to determine which team Mike Murphy will be masterminding a shadowy conspiracy against. The Super Bowl: Over 5,000 accredited media members from around the world will cover the game. Regular season hockey: No single game would ever attract that many reporters, as doing so would divert valuable resources from around-the-clock trade deadline coverage. The Super Bowl: Expect to see thousands of towels being waved madly by diehard Steeler fans throughout the game. Regular season hockey: Expect to see dozens of towels being thrown in by the Ottawa Senators during the opening shift. 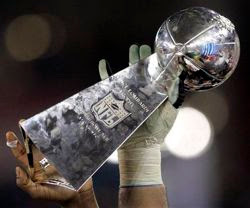 The Super Bowl: The only thing we can say for sure is that when the final whistle blows, we'll be left with one winner and one loser. Regular season hockey: There's a decent chance the game will end with one winner and one tie. The Super Bowl: Expect to hear plenty of references to ex-Packer Brett Favre, the former superstar who embarrassed himself with one too many comeback attempts and eventually became a running joke in the sports world. Regular season hockey: Thankfully, it's been years since Peter Forsberg… wait, he's what? You're kidding. Good lord, please say you're kidding. The Super Bowl: If you see a player jump into the first row of the stands, it's because he's a Green Bay Packer and has just scored a touchdown. Regular season hockey: If you see a player jump into the first row of the stands, it's because he didn't really appreciate that fan's most recent reference to his mother. The Super Bowl: Pittsburgh is known for being involved in games that feature violent head shots, which are immediately followed by swift and severe sanctions from the league in an effort to reduce concussions. Regular season hockey: Pittsburgh is known for being involved in games that feature violent head shots. Haha, laughed at the Forsberg-thing. That is so true. Usually, a really good DGB gets a 4.70 rating or so, and I'm thoroughly surprised to see such a pitiful rating of 4.23. This is very good. Not as creative as Brian Burke's Twitter or the scandal flowchart, but it's very appropriate. Well done as usual. this blog is a beauty. great work DGB! Phenomenal post. The DiPietro, Forsberg, and Kovy jabs are gold, Jerry, gold! You're a genius. I love the last one the best. I'm equally insulted on Bozie's behalf. Which Brenter is that? Brooksie, Simpsie, or Burnsie? The last one was brilliant! Foppa has YET to retire. He's played actively in Sweden. He didn't retire once. Let alone twice unlike Favre. And if Foppa did pull a Favre, he would be practicing/signing with the Red Wings. So irrelevant comment is irrelevant. Didn't Pierre McGuire comment that one World Juniors player's jump towards the glass after scoring a goal was like a Lambeau Leap? You mean The Super Bowl can't end in tie?I have to say this list made me laugh out loud. The Super Bowl: Watched by the world. Regular season hockey: Watched by Canadians. @Anonymous: since when is America "the world?" Sure, it gets coverage outside North America, but not a great deal. Most people outside North America aren't very interested in our brand of football, be it NFL or CFL.